Heat the oil in a saucepan. Fry the onion, garlic, celery, pepper and dried chilli until the vegetables begin to soften. Mix in the cumin, paprika and oregano and fry until the vegetables are soft. Add the bay leaf, cayenne pepper, lemon rind, organic tomatoes and rinsed beans. Season to taste and simmer gently for 10 minutes. 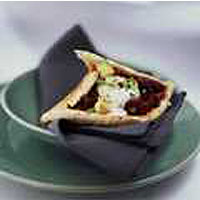 Offer warmed pitta bread, sour cream and sliced avocado, tossed in a little lemon juice, with the beans.